In the spirit of Thanksgiving, offices can close early and staff are permitted to leave work at 3 p.m., Wednesday, Nov. 23. Most nonexempt employees scheduled to work eight hours on Wednesday will work six hours and receive two hours of holiday pay. Those employees who will have already worked their shift by 3 p.m. or those who must work their full shift because of the nature of their position will be given the option of taking two hours of paid time off on a different day. If there are any questions, please contact your immediate supervisor or Human Resources. Nov. 17: College Council reviewed a report from Faculty Interests Committee regarding 2012-13 faculty salary recommendations. Discussion focused on looking at measures beyond salary when considering the benefit of working at Luther as well as using additional benchmarks, including the AAUP 70th percentile total compensation benchmark and an average salary ranking that would place Luther between 7th and 9th within a peer group of 23 schools. Using broader measures of compensation benchmarking is consistent with TG 150 recommendation number 39. College Council also affirmed that whatever salary/compensation increase is approved will be consistent for all employees. Discussion also included the appropriate utilization of the health care reserve to address compensation goals since it is now significantly above the goal of sustaining a reserve of 50 percent of projected claims. The Health Care Council will discuss this idea. College Council reviewed 2011-12 fall budget adjustments. Strong retention and fewer itinerant students have resulted in an increase in revenue beyond summer 2011 revenue projections. Fall 2011 to spring 2012 retention will determine if this increased revenue will be realized at the end of the fiscal year. December meetings will focus on the continuing development of the 2012-13 budget assuming 660 new students (620 first-year and 40 transfers) as per TG150 recommendation 42. Wednesday, Nov. 23: Closing at 2 p.m.
Wednesday, Nov. 23: 8:45 a.m.-4:45 p.m.
Tuesday-Wednesday, Nov. 22-23: 7 a.m.-7 p.m.
Saturday, Nov. 26: 10 a.m.-7 p.m.
Wednesday, Nov. 23: 9:30 a.m.-4:30 p.m.
Tuesday, Nov. 22: dinner 5-6:30 p.m.
Wednesday, Nov. 23: brunch 11:30 a.m.-1 p.m., dinner 5-6:30 p.m.
Saturday, Nov. 26: brunch 11:30 a.m.-1 p.m., dinner 5-6:30 p.m.
Sunday, Nov. 27: brunch 11:30 a.m.-1 p.m., dinner 5-7 p.m.
Wednesday, Nov. 23: 7:30 a.m.-3:30 p.m.
As you may be aware, the U.S. Postal Service has made operational changes. Luther is currently expecting about an hour delay in receiving the mail, which will mean an hour delay in delivery on campus. Once changes have been implemented a the USPS, we will adjust delivery times and update the community. Please contact Kim Bohr, 387-1013, with questions and concerns. The GE Wind Turbine began operation Nov. 1. The turbine is expected to produce approximately five million KWH per year, approximately 1/3 of Luther's annual consumption. The turbine has a 9-10 year payback on investment and is projected to save the college at least an additional $3 million in electricity costs over the 20-year life span of the turbine. For more information see http://www.luther.edu/sustainability/energy/windturbine and/or visit the Luther Sustainability Facebook page for updates on operations. Rachel Narum, Midwest Group Benefits representative, will be in Borlaug, Dahl Centennial Union, Monday, Dec. 5, 9:30-10:30 a.m., and Tuesday, Dec. 6, 3:30-4:30 p.m. Rachel will review the 2012 flexible spending account plans and answer health care questions. Eligible Luther employees will have an opportunity to enroll in supplemental life insurance coverage through Luther’s life insurance provider, The Hartford. A representative will be available to explain the program and answer questions in Borlaug, Dahl Centennial Union, Monday, Dec. 5, 8:30-9:30 a.m., 11:30 a.m.-12:30 p.m., and 1:30-2:30 p.m. Enrollment packets from The Hartford will come through campus mail. The Catering Department is adding another dinner during Christmas at Luther - there will now be two dinners on Friday, Dec. 2, one dinner prior to each performance. Check the Luther College Box Office for tickets and more information or email <catering>. A Healthy Back Fair will be held in the Union Wednesday, Nov. 23 from 8 a.m.-noon. Massage Therapist Matt Johanningmeier will offer stretching exercises that can be done at your work site. Storey Kenworthy will display different styles of office equipment and there will also be free massages. Contact Greg Lonning for more information. There will be two opportunities for informal conversation with the technology and information literacy workshop participants representing the art, economics, education, music, nursing, social work and theatre/dance departments, and members of LIS. Bring a lunch and join us in the Mott Room Monday, Dec. 5 from noon-1:30 p.m., or Tuesday, Dec. 6 from 11:45 a.m.-1:15 p.m. These will be open sessions, so please come and go as your schedule allows. Questions? Contact Andi Beckendorf <beckenan>. Nov. 22 with direct deposits hitting employee accounts Friday, Nov. 25. The cut-off time for turning in claims to Midwest Group Benefits will be noon Monday, Nov. 21. Processing for the weeks of Christmas and New Year's will be the normal time line with processing on Wednesday and direct deposits hitting the employee's accounts on Friday. Sign up for W-2's online. It is easy to do. Instructions are located at hr.luther.edu. Go to "Forms for Faculty and Staff" and under "Tax Forms" choose "W-2 2011 Options." Mac users: do not use the "preview" application to view your W-2. If you chose the electronic option for your 2010 W-2 you do not need to it again for 2011. Go to "W-2 electronic consent" under Employee Profile at my.luther.edu to see which option you chose for 2010. Remember-the electronic option is the sustainable option. Luther Book Shop is holding a bargain children's book sale offering hundreds of titles priced $1 and up. Great selection. Includes holiday titles. The sale continues while supplies last. How can you help us? Contact the Technology Help Desk. By using the Technology Help Desk to request services, you are increasing the hours of work LIS can spend on your project or request. Whether it's a password reset, a great idea for a new report you want, or help with Datatel or Katie, contact the Technology Help Desk first. Thanks for your help. Notice for Luther employees and spouses, 65 and older contemplating retirement: Luther has joined with Humana to offer a group Medicare Advantage plan which includes medical and prescription coverage with very competitive rates. This is available to Medicare eligible employees and spouses after retirement. Pre-enrollment questions may be directed to the Humana group customer service, (800) 824-8242. Be sure to reference Luther College. The Winneshiek Public Health office only charges a $15 administration fee for vaccination(s) of children 18 and under. The Luther health plan reimburses a maximum $10 per immunization. Vaccinations at the clinics cost substantially more. Call Human Resources, Sheryl 387-1134, Marsha 387-1415 or Roy 387-1189, or Midwest Group Benefits at 382-9611 for more information. TheaterworksUSA will present "A Christmas Carol" Tuesday, Dec. 6 at 10 a.m. and 12:30 p.m. in the CFL. The performance is directed towards children in grades one through eight. The show is intended for a younger audience but accessible for all. Tickets are $3.50, available at the Box Office. Connie Barclay is now the administrative assistant in the Modern Languages and Literature department. She was previously in College Ministries. Her new office is Main 215, telephone 387-2160. Research analyst: in the Office of Assessment and Institutional Research. For more information see the HR website: http://www.luther.edu/hr/staffvacancies/. Many thanks for everyone's support during my wife Alison's cancer treatments over the last few months. Your thoughts, prayers and wonderful meals were much appreciated. She has now finished all treatments at Mayo and is doing well. To Joyce Becker and family on the Nov. 15 death of her mother Doris Hubka, 81, of Cresco. Todd Green wrote an op-ed piece for The Huffington Post on Nov. 17 called "Where Is the Courage in College Football?" He contrasts the recent failure of courage in college football in light of the Penn State scandal with the model of courage displayed by Luther's Chris Norton. The article can be found at http://www.huffingtonpost.com/todd-green-phd/courage-in-college-football_b_1091565.html?ref=fb&src=sp&comm_ref=false#sb=1149080,b=facebook. Harland Nelson, professor emeritus of English, presented Dickens's "A Christmas Carol" (the novelette and two films, one starring Alistair Sim (1951, b/w) and the other George C. Scott (1984, color) to "Learning Is ForEver (LIFE)" in Rochester Nov. 17. This was a radically selective version of what he presented to "Lifelong Learners" here at Luther ten years ago, as the first in the series of community symposiums administered by Campus Programming. Alfredo Alonso Estenoz published his article "The Words that Are not There: Chesterton in Borges' 'The Theme of the Traitor and the Hero'" in the fall 2011 issue of Variaciones Borges, published by the Borges Center at the University of Pittsburgh. The article was translated from Spanish by Kjersten Mathsen '08. Mark Z. Muggli presented a paper, "'After the first death, there is no other': Except in the Case of Falstaff," at the Blackfriars Early Modern Drama Conference in mid-October. The conference brings together stage practitioners and literary scholars, and highlights productions at the American Shakespeare Center, Staunton, Va., the conference site. Kristy Gould attended the Society for Neuroscience conference in Washington, D.C. Nov. 12-16 where she gave the research presentation, "Hippocampus neuron density in five species of birds in the Corvid family." Former student Karl Gilbertson '11 was a co-author on the presentation. Kirsten DeJarlais '11 and Holly Godor '13 presented original research papers they wrote for Nancy Gates Madsens' senior seminars in Latin American Literature at the Streamlines Undergraduate Conference for Language, Literature and Writing, held at Clarke University on Nov. 12. Godor presented her paper "Civilización en un mundo bárbaro en Facundo y Waslala" ("Civilization in a Barbaric World in Facundo and Waslala"), and Kirsten presented two papers: "Una crítica de la metáfora del cuerpo femenino como cuerpo nacional" ("A Critique of the Metaphor of the Female Body as the National Body") and "Una crítica ecofeminista de las novelas de Doña Bárbara y Waslala" ("An Ecofeminist Critique of the Novels Doña Bárbara and Waslala"). Gates served as moderator for one of the panels on Latin American Literature. Rob Larson and Tim Schweizer attended the 2011 MMA Fall Educators' Conference Sept. 21-23 in St. Louis, Mo. Rob presented two papers: "Models for Undergraduate Research and Hands-On Marketing Applications in Non-Classroom Settings" and "Using a Cooperative Education Model for Integrating Social Media Into the Business and Communications Curriculum." Both papers were published in the Marketing Management Association 2011 Fall Educators’ Conference Proceedings. Tim presented two papers: "A Classroom Guide to Teaching Idea Mapping," which was also published in the conference proceedings, as well as "Classroom Exercises for Introducing TRIZ." Former classics department member Shari Nakata has had an article accepted for publication: "Egredere o quicumque es: Genealogical Opportunism and Trojan Identity in the Aeneid" will be published by the Classics journal Phoenix, based at the University of Toronto. Laura Peterson, assistant professor of environmental studies and chemistry, has received a $120,197 grant from the National Science Foundation to support the acquisition of laboratory instruments for paleoclimatological research. The one-year grant will fund the purchase of an accelerated solvent extractor and a gas chromatograph, the instruments necessary to perform alkenone analysis in Peterson's research laboratory at Luther. The short story "Überrollt" by Sören Steding about organically grown man-eating car tires was a finalist for this year's Odenwaldkrimi Award. It has been published in the Anthology "Mords Spuren." Robert Christman's book, "Doctrinal Controversy and Lay Religiosity in Late Reformation Germany: The Case of Mansfeld," was recently published by Brill Publishers. The monograph is an archival study that analyzes the degree to which common people came to understand Lutheran doctrines by the second half of the 16th century and how these doctrines informed their lives. Minnesota Public Radio will broadcast "Christmas at Luther: Journey to the Light" Thursday, Dec. 15 at 8 p.m.
Luther will present the 2011 production of its nationally acclaimed "Christmas at Luther" concert Dec. 1-4 in the Center for Faith and Life. First floor Koren is hosting a mini golf tournament with proceeds going towards Christmas Cheer. Teams of four are needed with at least one member being a Luther faculty or staff person. Every Thursday you will putt your way through an obstacle course. Cost is $1 per team, but we welcome larger donations. Bulletin board on first floor Koren is where you sign up and get more information. Sign up by Monday, Nov. 28. 5-7 p.m. Sponsored by SWA and One Campaign. Luther will welcome new international students to campus in the spring and we are interested in finding Friendship Families to host them. If you have questions, or an interest in hosting, contact the Diversity Center, 387-1014. We are excited to welcome them and appreciate your support. Calling all artists. Be a part of the Luther Artists' Collective Christmas sale the first weekend of December. We are looking for prints, sculpture, pottery, knitting, jewelry, painting, photography, hand-bound books and more. 30 percent of profits go to LAC, and 70 percent directly to artists. Contact Astri Snodgrass at <snodas01> if you are interested in selling your work. Wanted: Full-size metal bed frame, only need the metal bottom to hold box spring and mattress off the floor. Contact Emily Neal, 387-2138, <nealem01>. Wanted: 25-30 used steel t-posts. Contact <davismar>. For sale: Maple finish china hutch in very good shape. $200 OBO. Contact <lensinpe> or 380-9250. Wanted: Give old bags new life by donating used plastic shopping bags to Marty's C-store. Wanted: Looking for someone to design a 3D computer model of a 1930s safety razor prototype. Price negotiable. Call 379-6130. 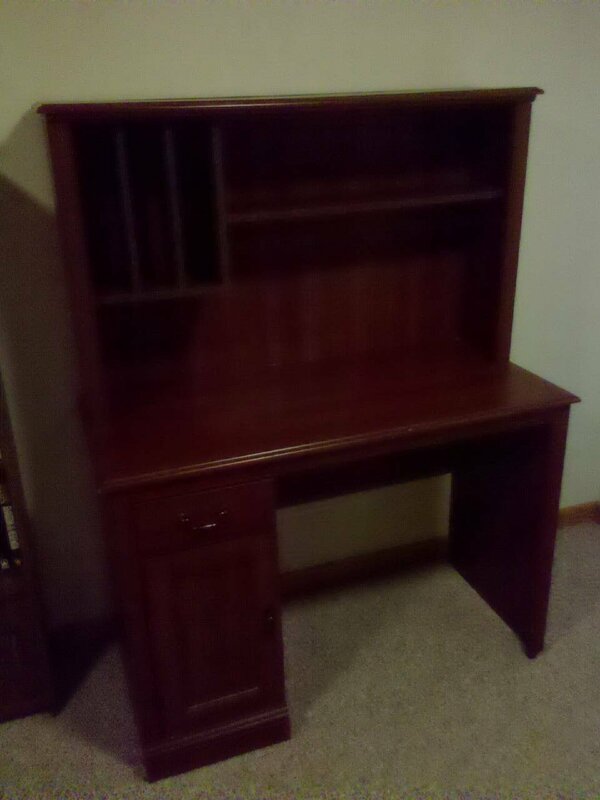 Free: Small computer desk available. Email <welplu01>. View at: http://i.imgur.com/rQDVS.jpg. Wanted: Would like house cleaning jobs in the Decorah area. Call 382-3978 or 379-6070. Found: Watch found in Health Service. Call to claim, 387-1045. For rent: Two-bedroom, two-story house, one half mile from Luther campus on six-acre wooded lot. Includes kitchen stove, refrigerator, dishwasher, washer/dryer, high-efficiency gas furnace and small wood stove in living room. Attached one-car garage with storage room. No pets. Available Dec. 1. Phone 382-3888 (day) or 382-8025 (eve). For sale: 2007 Chevy Silverado 1500 extended cab, 135,000, 5.3 automatic 4x4, dark blue metallic. Lots of options. Call 203-1702. Misplaced: 24"x30" white foamcore sign with velcro on the back and a large black printed notice with orange highlights on front: "All Welcome! Sounding the Sonnets, 12:05-12:10, M-F." Contact Mark Z. Muggli <mugglimz> or 387-1596. For sale: Five-foot clawfoot cast iron bathtub in great condition. You haul. Asking $25, which we'll donate to the Food Pantry. Contact <davismar>. Moving sale: Two sets of four 24" counter height stools with backs and new cushions. $50 each set. Three XC ski sets, one for 10 or 11-year-old kid, $20, one pretty wood set with three-pin bindings, $40, one with size 41 boots, $20. Spinning wheel, big box of beanie babies. Contact [email protected] or 380-3824. Found: An iTouch was found in the Sampson Hoffland Laboratories building in the upper balcony by the Chemistry Department. Contact Lynn Williams, 387-1117 or <willialy> or stop by SHL 231 to claim. For rent: Beautiful three-bedroom, two-bath home next to college. Fireplace, all appliances including washer/dryer, two-car garage. Available Dec 1. Call 387-0242. Wanted: Sewing thread for labeling in the human dissection lab. Any amount, any color, any vintage-we use it all. Send through intracampus mail to Wendy Stevens or leave it at Wendy's office, SHL 190F. Named after Matthew "Flip" Busche, a professional cyclist and recent graduate of Luther, "Flip’s Shop" opened in October, offering students, faculty and staff a place to learn about bike maintenance in a friendly, student-run atmosphere. Only charging for parts, the shop's tools and services are free. The shop is run with the intention of helping bikers become more knowledgeable about how their bikes work. With the help of Luther's Wellness department, two brand new 29-inch mountain bikes and helmets are available for check out for 24-hours at a time for an annual fee of $20. Trail maps and group ride information can be found in the shop. More information about SPOKES, Luther's club for biking enthusiasts, and Flip's Shop can be found here. During the holiday season, food temptations are everywhere. It can be tough enough to navigate the turkey buffet without having your great aunt force an extra helping of potatoes on your plate or resisting Grandma Dolly's pleas that you take a second piece of her famous apple pie. Food pushers range from well-intentioned loved ones to total diet saboteurs. Regardless of their motivation, it's important to stick to your guns. You can always be honest and say that you're simply trying to eat healthier, but if that response gets ignored (or doesn't come easily), the following retorts to their food-forcing ways will keep you in control of what goes on your plate and in your mouth. Your Response: "But I'll probably live to celebrate more holidays if I stick with my diet plan." Why It Works: People can sometimes see healthy eating as vain—a means to the end result of losing weight and looking better. It's harder for a food pusher to argue with you if you bring attention to the fact that you eat right and exercise for better health and a longer life. For the other responses see: http://www.sparkpeople.com/resource/nutrition_articles.asp?id=1685.